Included below are the details on the Doctor Who Magazine: The Doctor Who Companion – The Eleventh Doctor Volume Six. Click on the cover for a bigger version. The 2012 series of Doctor Who saw married couple Amy (Karen Gillan) and Rory (Arthur Darvill) joining the Doctor (Matt Smith) for their final adventures together in the TARDIS. Their travels in time and space took them from the terrifying Asylum of the Daleks, to the American Wild West, and came to an abrupt and sad conclusion in New York. They encountered insane Daleks, a cyborg assassin, River Song, an invasion of mysterious black cubes, the Weeping Angels… and dinosaurs on a spaceship! Now, Doctor Who Magazine takes you behind the scenes of these astonishing episodes with an in-depth episode guide – including original storylines, deleted scenes, media appearances, ratings information and hundreds of facts about the day-to-day life of the making of Doctor Who – all illustrated with gorgeous, never-before-seen photos. This collectors’ edition examines all five episodes of the latest series – ASYLUM OF THE DALEKS, DINOSAURS ON A SPACESHIP, A TOWN CALLED MERCY, THE POWER OF THREE and THE ANGELS TAKE MANHATTAN – as well as the five-part mini-adventure POND LIFE, the DVD extra NIGHT AND THE DOCTOR and the two ‘Script to Screen’ winning entries DEATH IS THE ONLY ANSWER and GOOD AS GOLD, plus the Doctor offering his clothes for auction for CHILDREN IN NEED in 2011. Written and researched by Andrew Pixley, this is your essential 100-page guide to Series Pond! 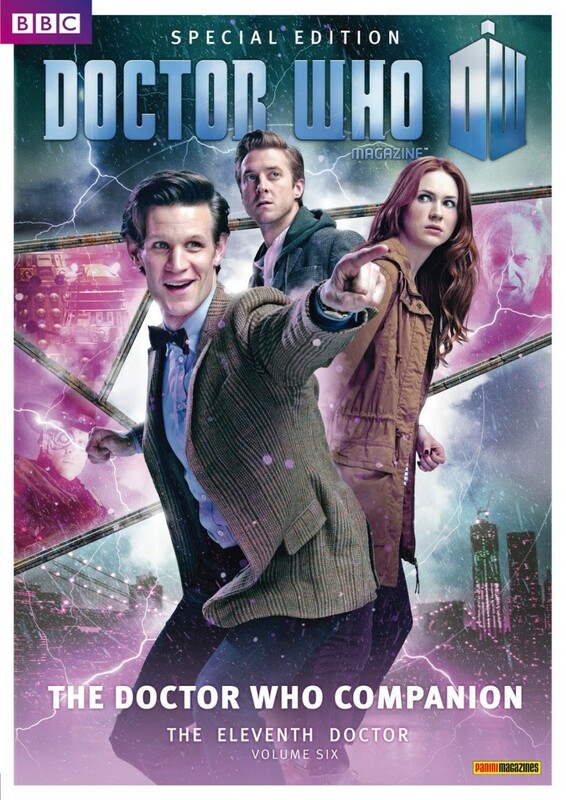 DWM: The Doctor Who Companion – The Eleventh Doctor Volume Six is available from Thursday 20 December, priced £5.99. Jenna-Louise Coleman to get boyfriend in Who?